Education Technology and Integration at it's best! If I can do it...you can too! I teach in the state of Michigan. We had a fairly mild winter until recently. There are districts that have 14, even 19 days of school cancelled due to weather. In my 20 years of teaching, I do not remember a winter like this. I really needed my students to keep learning. One prep even had a major project to complete. I use Google Classroom to deliver all of my lesson materials. I decided to keep my students learning and go beyond the walls of the school to learn. I am fortunate. I teach in a geographical area where almost every student has internet access and devices of some sort. Even if a student only has a smartphone, most work can be completed on it. It is not ideal due to screen size, but will work, if necessary. A storytelling app that lets you narrate, animate and record your own cartoons. Even my 8th grade students have a blast with this app! Available through apps and a web version too. FREE, you can upgrade, if you choose. Available as an app and web version. To deliver instruction, try screencasting. I use this often to deliver instructions. It allows students to learn at their own pace, when they are absent, or need the instructions repeated to them. Is a simple, tool that is a Chrome Extension. You can use for free, or pay for an upgraded version. 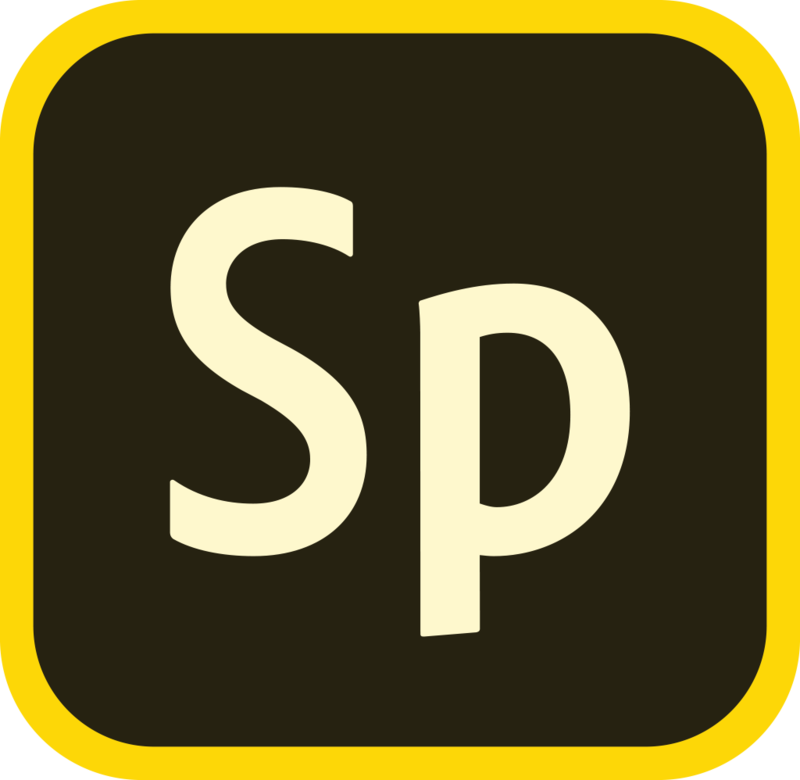 One of my most favorite tools that integrates with Drive and is web-based. For $5 a month, you can edit video, screen cast, green screen, and voice over. There is a wonderful version for schools too! 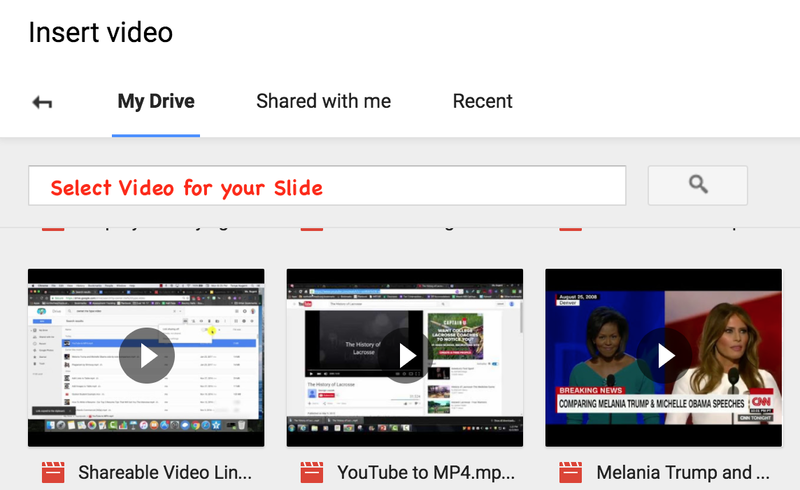 Once you produce your screen cast video, you can easily upload it to Google Drive and add your screen cast to your Google Classroom Post in addition to any necessary materials. Using these simple steps, allowed students to continue to learn and finish their projects on time. 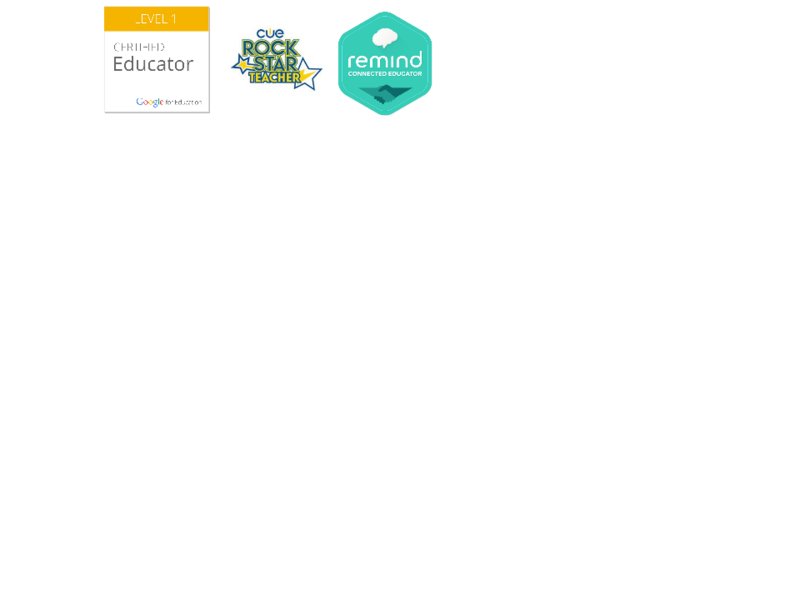 Consider using some of these tools to extend your lessons beyond the walls and keep students learning. Google Classroom Refresh: Where is the About Tab? With a significant update to Google Classroom, one thing missing is the About tab. I liked having the About tab and used is as a resource area for students. I places links to my course syllabi, finished early choices, links to important external website, etc. 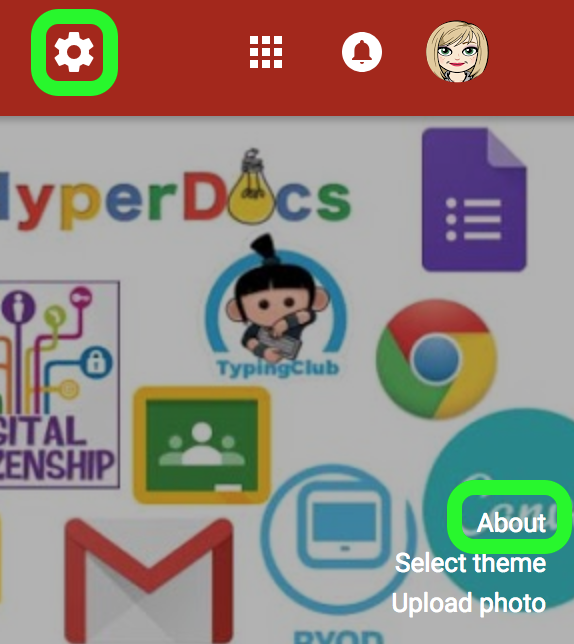 After thinking outside the box, I came up with a way to still have the same resources as before, just in different locations with the refreshed Google Classroom. Even though the traditional About tab is now gone, you can still access an About area. It is located in the Stream tab. If you select About, you can edit an area to include the course description, for example. Some have included links to items as well. You will also notice the Class Code and the option to display the code in a projected screen. To edit this area, you have to select the Widget. I add additional information for students to have as reference throughout the year. With the original About tab gone, I utilized the Topics feature in the new Classwork tab. 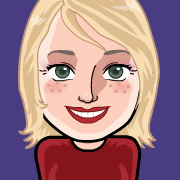 I created an About/Resource Topic. Next I added links, docs, forms, and other information as an Assignment. I set the assignment with No Due Date and Ungraded. Students can select the About topic for information needed throughout the year for any necessary resources. 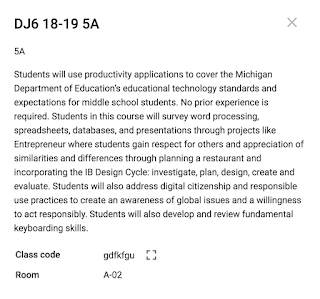 Since I created assignments, I plan to have students 'click around' the updated Google Classroom and Mark as Done each of the assignments listed in the About/Resources topic. 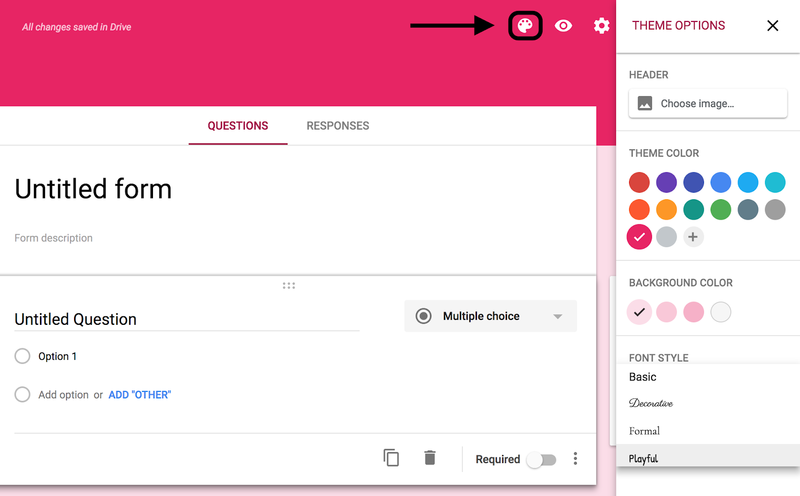 One of the features I missed from the old version of Google Forms were the font choices and selection of theme colors. Look no further! Google is rolling this feature out to everyone! Yes, you only have four font choices, hopefully they will add a few more, but they did expand the color selection and background color choices. 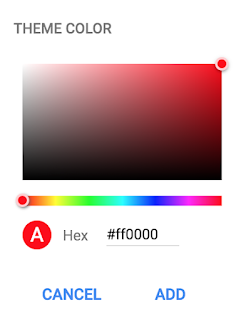 If you select the Add Custom Color icon, you can have even more color choices! For additional information, select this link to Google's help. This should jazz up those Form quizzes we educators are fond of! Smore is a site that hosts simple newsletters and flyers. You can use it for free or they have special pricing for educators for more features. Smore allows you to add links and videos to your pages. I use this for my class syllabus, newsletters, technology tips, and more. 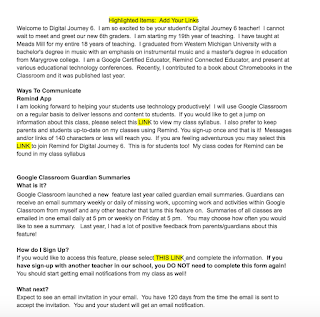 Smore creates a link and I add the link to my email for parents and on my About page of Google Classroom. My favorite tip: No copying! If I find a mistake, I make the change and update the page! 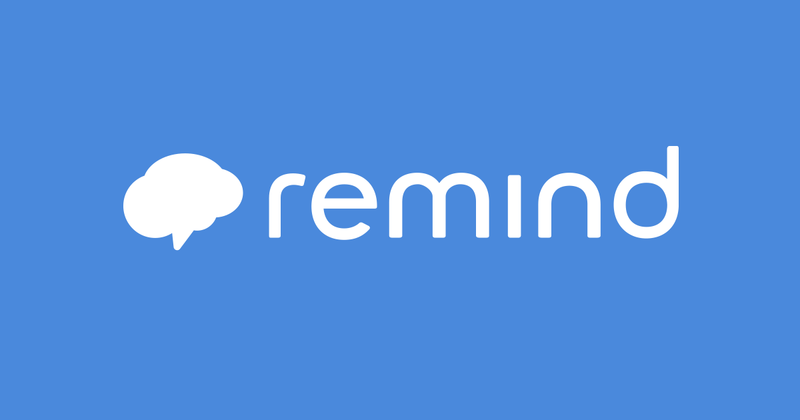 Remind is a free text messaging app to help teachers communicate with parents and/or students. You can send images, links to sites or videos and messages of 140 characters or less. This is a big hit with my parents as they only have to sign up once and messages are delivered to them. It is especially popular with my students when we have a snow day. I teach 12 class on an A/B schedule with 330-380 students. 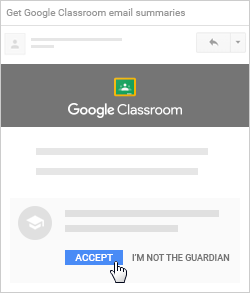 I had to figure out a way to collect emails from parents to set parents up with Guardian Summaries in Google Classroom. Google Forms was the answer! I set up a form asking for: Student last name, student first name, current grade, class title, class hour, and parent/guardian email address. I include a link to this form in my email to parents so they can sign up ahead of time. See my previous blog post for more info! Add-ons help with the functionality with Google Forms, Docs, and Sheets. Even though you can set up a notification through Google Forms, I still like to use the Form Notification add-on for this project. I can have an email sent to me after every 20 responses are collected or change it to every response. I can also set up the notification to send an email back to the email address they entered confirming receipt. My message says, "Thank you for responding. Be on the lookout for an email invitation after school starts! You have 120 days to accept the invitation. " 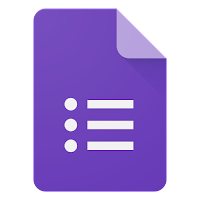 When I have time I go to my response collect Google Sheet and copy and paste parent emails into Google Classroom. Select the image above to view the sample letter. Many teachers are organizing and cleaning as they wrap up their year, but what about students? Teachers should help students not only clean out their lockers, but help students organize and clean their Google Drive and Classroom. Open Google Drive and search for any untitled doc, sheets, slides, etc. Rename the items or move to the trash. To rename an item, right click and select rename. Have students create a general folder for this school year. For example, 2016-2017 or their grade. Open the folder up with a double-click. Create sub-folders for each subject, if desired. Add a color to your folder(s) if you choose. Pay attention to the awesome names of each color like Slime Green or Macaroni! Many students often forget that they have a classroom folder in Google Drive. Now that I have completed my third year as a teacher using Google Classroom, I like to organize my folders within Classroom. Students could do the same OR move their work out and into their previously created folder (See Step 2). Create a folder for the year, 2016-2017 Classes or the year in school. For example, 8th Grade. Select class folders and drag into the newly created folder. Step 4: If it isn't archived, unenroll! August or even September hits and you, the student notices that your teacher(s) has not removed or archived their class and you are still enrolled. No worries! You can unenroll yourself and make that "tile" disappear! You will still have your work in your Google Drive Classroom folder. How to unenroll yourself from a class. No worries, Google has you covered. Google Transfer helps G Suite districts by easily copying and moving your email and Google Drive files. 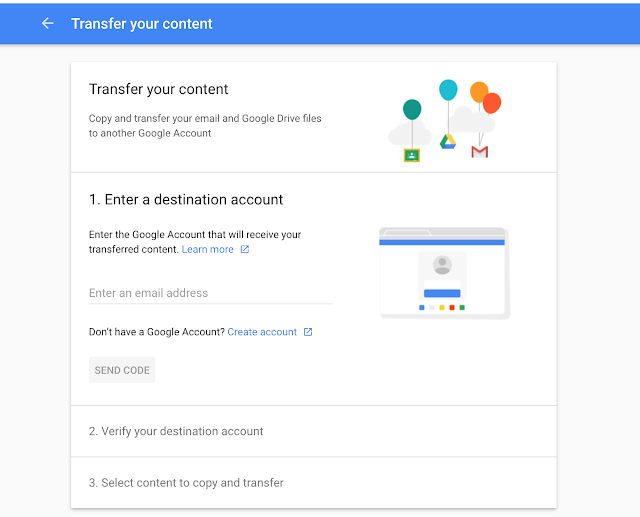 Want to move your items to a new Gmail or Google Account? Want to create an archive of your data? 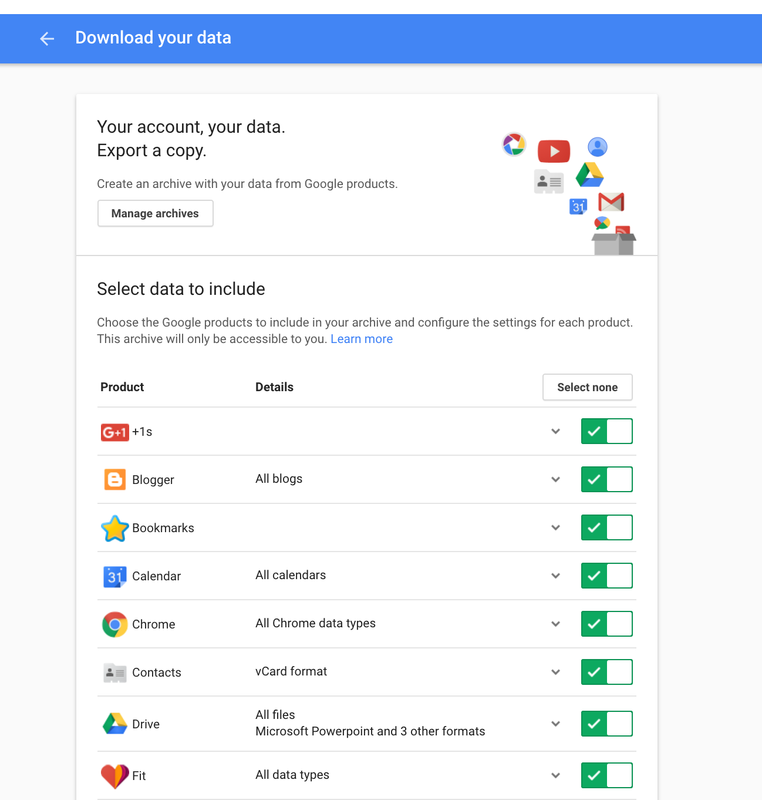 Google Takeout will export the data you choose into a zip file. 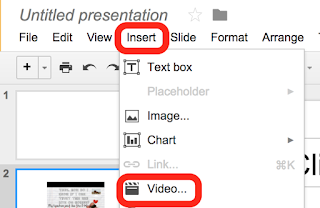 Google Slides: Insert Video from Drive! Many districts restrict usage of YouTube. 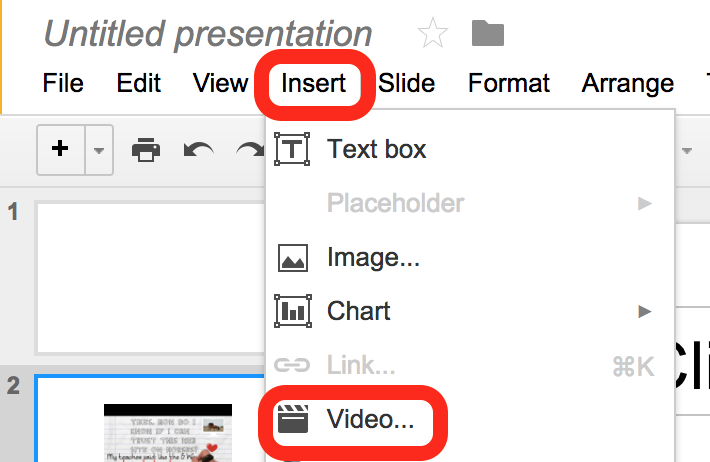 This has been a real challenge when working in Google Slides. Until recently, you could only embed videos from YouTube. 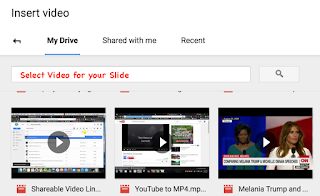 Now, you can embed videos from your Google Drive into Google Slides! Your slide should look similar to the image below with an embedded image of the video. When you switch to presentation mode, you will be able to play the video. Some of you may have the question, "How do I convert a video to an MP4?" Here is a link to a video to help you out. As always, make sure you cite your sources in your work. 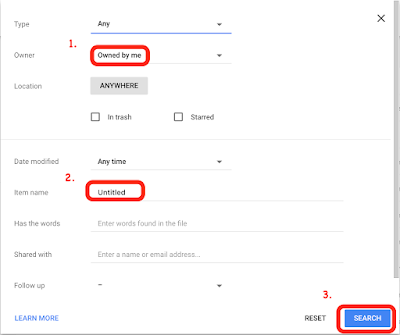 After you convert the video, upload it to Google Drive and turn the link sharing on. I personally set most of my videos to "anyone with the link can view" unless it is of students. I am very happy about this update! Bravo Google! 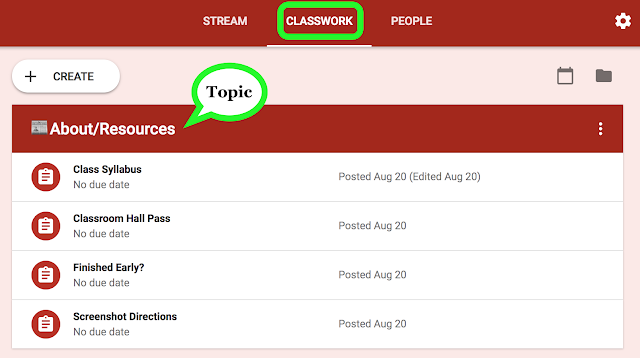 Since the launch of Google Classroom, educators have been asking for a way to assign group work and ways to differentiate their instruction. I even came up with complex directions for students with group work which was time consuming and tedious. 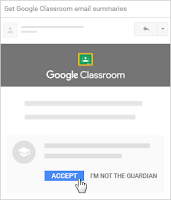 Many educators create multiple Google Classrooms to address the issue. I saw one student's account had 12 different topics for their 5th grade class last year! Google has heard us and answered us! You can now assign work to an entire class, a group of students or even just one student! 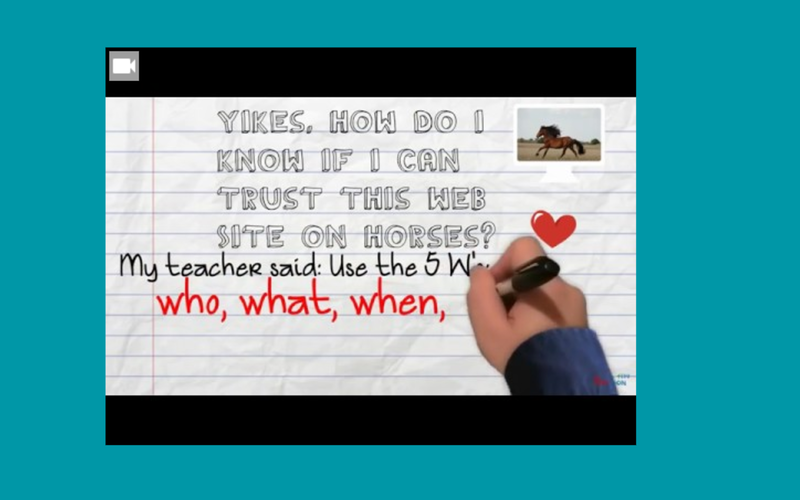 You can even post a question or an announcement to an entire class, a group of students or even just one student too! I could go on and on with listing the possibilities. These are just a few that popped into my head. The one item you may want to think about is document organization. If you create variations on the same assignment, I suggest you come up with a system that clearly, yet discreetly identifies the assignment. I prefer Alice Keeler's tip on numbering assignments (#001, #002, etc.). You could take that one step further with #001, #001.1, #001.2 or #001a, #001b, #001c, for example. This would keep all of the work together in your Google Drive and in numerical order. I find Alice's numbering system helpful for myself and when speaking with students about work. It is much easier to reference a number over a long title. 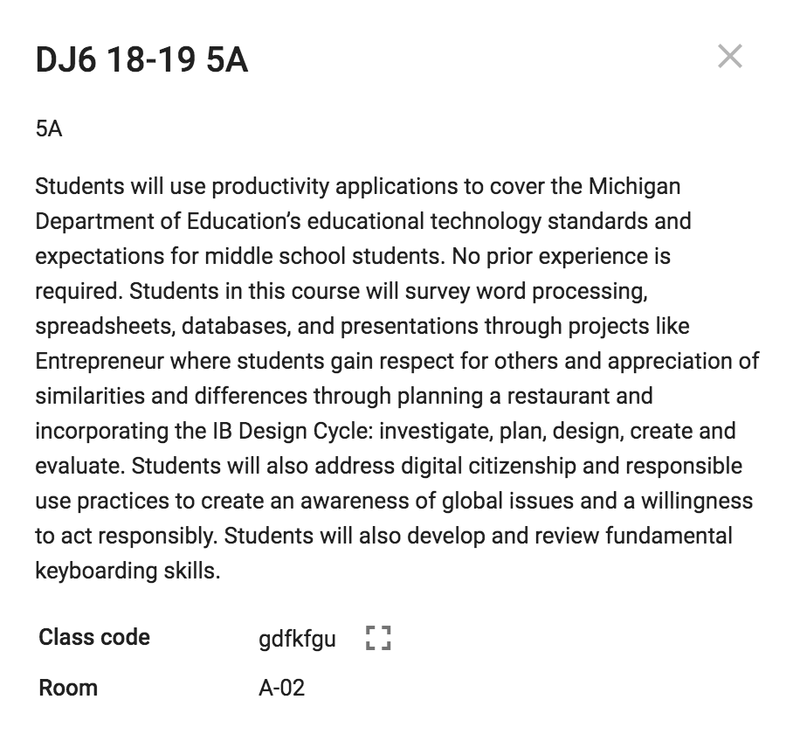 For more information, check out Google Classroom's Help page.